On Thursday, October 19th, we flew to Cape town via Safair airlines. A fairly quick 2-hour flight had us arriving at the Airbnb late. The next morning my husband Scott and my in-laws Deb and Brett and I left early to head down to the Cape of Good Hope and Cape Point, the southern most point of the African continent. En route we came through Simon's Town and stopped into Afreek, a leather crafts shop that had the most beautiful aprons and bags. Alfred, the owner, did a fantastic job customizing a heavy duty canvas and leather apron for me on the spot. He shortened the ropes for me for a tighter fit so I don't get entangled in my printmaking equipment, and he finished it all off by embossing my name in the leather pouch. It was a real pleasure meeting him and learning his story. He also had a great sign at his store front that we artists can all identify with. Alfred at Afreek adjusting the length of the leather straps on my brand new printmaking apron. Next stop, Boulders Beach was a real treat. A large colony of African Penguins live and breed there and seem to be enjoying life. We had the pleasure of walking down the boardwalk and having a close up view of the Penguins in their natural environment without disturbing them. I may have taken 200 photos of just the penguins. They are such a pleasure to watch. I wish I could have spent all day there. This is my favourite part, seeing them swim in the waves! So cool! Penguins chillin' in trees. Who knew. Haha, my favourite little guy. After Boulders Beach we continued on and entered Cape Peninsula National Park. This was another place where I wish we would have had at least a whole day to explore it, there are many beautiful hikes in the area and the views are breathtaking. Unfortunately our timing was tricky as we had booked tickets to see Robben Island, which have to be booked sometimes a month in advance, so we did not have a lot of time to explore the Cape. we spotted it in bloom was right next to a gas station toilet. The Cape of Good Hope and Cape Point are two different spots in the same area. Cape of Good Hope is the South-Western most spot on the African Continent while Cape Point is the Southern most tip of the African Continent. Deb and Brett took the Flying Dutchman Furnicular up to the lighthouse while Scott and I walked. What a beautiful spot! The currents of the Atlantic ocean (Benguela current) and the Indian Ocean (Agulhas current) meet right around Cape Point. After enjoying a lovely walk and taking oh so many photos we headed back into Cape Town. The schedule was very tight (give yourself a generous 2.5h for the return trip so you have time for parking and finding the ferry terminal) but finally we arrived at the Robben Island ferry just in time to be at the end of the queue; we were lucky that it was a very full boat. 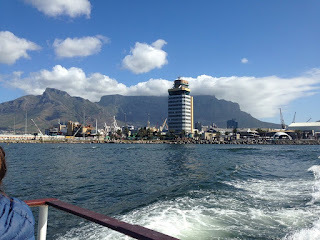 The ride to Robben Island was beautiful if you don't mind the catamaran ferry bobbing over some pretty big waves. I managed not to throw up by sitting all the way in the back on the bottom by the motors. Robben Island is a UNESCO world heritage site and it was the prison where many ANC political prisoners where held during Apartheid era, including Nelson Mandela. Today the prison is a kind of museum, where some of the last surviving prisoners have returned to give tours of the place and talk about their experience. Sipho was our tour guide and he spent 5 years on the Island in a cell with 20-30 other prisoners. Visiting the place and hearing about Sipho's experience was an intense and touching experience. Sipho telling us his story. The Limestone quarry on Robben Island where Nelson Mandela and many others were forced to work. The cave was the latrine which was one of many humiliations the political prisoners suffered. The pile of rocks were placed there by Nelson Mandela and the other political prisoners at a ceremony many years ago, they haven't been touched since. The ride back from Robben Island was much worse than the ride there. Urgh, definitely not a fan of freak waves. We finished the day at the V&A waterfront with dinner in a lovely restaurant. It seems a nice area for night time entertainment for the whole family. We all fell into bed at our fabulous Air BnB not long after. For all the adventures and excitement of day two in Cape Town stay tuned.